So I live in China behind the Great Firewall which makes it difficult to get the latest news. I of course have a VPN but it doesn’t always work, but when it does I use Pulse as my main news source. I used to use Twitter more and I even used to use Summify before Twitter acquired them, but after it’s demise I became a Pulse user and then it too was acquired. 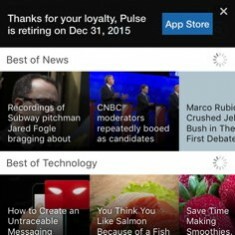 I can’t get confirmation beyond the screenshot I took, but it appears the standalone Pulse app may be retired permanently. This means I need to find another news app preferably one that works without a VPN pronto. I previously tried Feedly, I even tried Flipboard but stuck with Pulse for several years. It wasn’t perfect but Feedly was a major disappointment even after I exported my feeds from NewsFire on my Mac. Flipboard might work better on a tablet but I only have an iPhone. Regardless those two are probably out, so the search for a new News app is on. I tried Digg when it was relaunched so I think that is also out. I think I’ll give Zite a go but Flipboard acquired it, there can be only one news reader apparently. So I guess I’ll download Flipboard, have I mentioned how horrible the Internet is in China lately? I’ve been using the TSN.ca app a lot because with the exception of the ads and maybe some images it works without a VPN. However all it does is sports, maybe I’ll look at apps from other Canadian news agencies. The main LinkedIn app is right out, it became an annoying piece of bloatware and I removed it from my iPhone long ago. I’d get rid of Facebook if I could, but I’ve actually tamed it somewhat by unfollowing people strategically. Apps like this along with social media in general show the importance in strategically including images in your blog posts even if you may not have the copyright for that image. I recommend you have copyright for as many images as you can, lest you run into difficulties while blogging. Update: I’m using Flipboard when I can get my VPN to work, which isn’t always so I actually decided to give the China Daily iPhone app a try, it seems to have trouble working when the VPN is on just like other Chinese apps like WeChat. If you have a News app recommendation, especially one that functions well in China, leave a comment. This entry was originaly posted on October 30th, 2015 , it was last edited on February 26th, 2019 and is filed under: Information Technology and tagged: Flipboard, iPhone, LinkedIn, Pulse, Summify. I guess I’ll try it. I’ve been using Flipboard which is always autocorrected to clipboard. No apps work well inside the GFW. They can just make things worse whenever they want, apparently it is the worse Internet access in the world. Instagram was supposedly working in North Korea right up until this year but that is one of many many apps and websites you can not use in China. 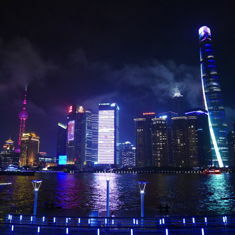 I’ve been also traveling to China regularly and my days wouldn’t go by without VPN there. But VPN makes the internet speed and connectivity even worse. Nonetheless, I will try news 360 next time around. If you happen to know good VPN software that works well in China, love to learn from you. I dropped out. I was talked into returning, told it was a misunderstanding, told things would improve in a week or two, things never improved. I did not attend graduation, my picture is most definitely not on the wall. As for China I use ExpressVPN but it is not 100% reliable nothing is in China not even WeChat. That is by far the most popular social network and the one I made my sister join so I can send photos etc. back. Skype works reasonably well as does LinkedIn I believe, but probably they agreed to let the government spy on their users.